How do you like your meatballs? On their lonesome? With store bought sauce and pasta? 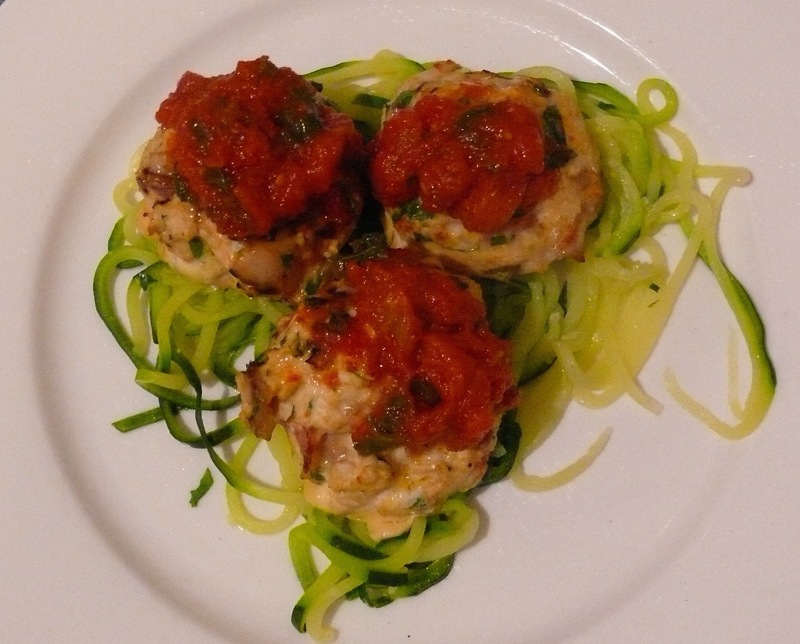 Or are you like me, sitting on some healthy Zoodles, and drizzled with homemade sauce? These Chicken & Bacon meatballs are such tasty little things. They are perfect as a main meal and even better the next day in your lunch box – if there are any left. While fresh homemade tomato sauce is a zillon times better than store bought. I have used canned tomatoes so you can make it when tomatoes are not in season and you haven’t preserved your own. Personally I happy with store bought canned tomatoes as I check the labels carefully and go with the lowest salt (sodium) and no added sugar I can find. Read the ingredient label and compare the brands. I use spiralised or julienned zucchini or courgettes (no wheat pasta here). They have an incredibly spaghetti like texture and taste when lightly cooked. I have mentioned before I think the taste of pasta is more about the texture in your mouth than the flavor. So I know what I want to have under and over my meatballs. Just before we get onto the recipe let me credit Lindsay from Dandy Dishes whose meatball recipe I tweaked here. 600g (1.4 lb) boneless skinless free range chicken thighs (or breasts if you prefer). 3 large zucchini (more or less) – spiralised or julienned into thin strips. Cube chicken and place into food processor. Process to a fine mince. This may only take a few pulses but will depend on your food processor. Heat a tbsp of olive oil and add the onion, cook on a medium heat until soft but not brown and remove from the pan. Add the diced bacon and crushed garlic then cook gently – about 5 minutes. Cool slightly. Add the onions, bacon, garlic to the minced chicken, along with the chili, egg, Homestyle Tomato Sauce and parsley. Form into small balls – around 2 tbsps of the mixture. Spoon a tsp of this mix over each meatball to glaze. Spiralise or julienne your zucchini. Microwave in a glass bowl with a little water and a tablespoon of butter or extra virgin olive oil until they are still slightly firm – el denta. Or steam over simmering water and once cooked to your preference add a tablespoon of butter or extra virgin olive oil. Place your zoodles on a plate, top with meatballs and extra tomato sauce. Thanks Monica and your recipe looks delish as well!